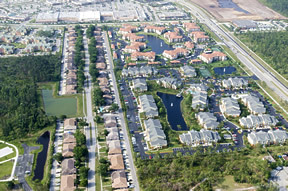 The Central Florida Water Initiative (CFWI) is a collaborative water supply planning effort among the state’s three largest water management districts, the Florida Department of Environmental Protection (DEP), the Florida Department of Agriculture and Consumer Services (DACS) and water utilities, environmental groups, business organizations, agricultural communities and other stakeholders. The CFWI Planning Area covers five counties, including Orange, Osceola, Polk, Seminole and southern Lake. The boundaries of the St. Johns River, South Florida and Southwest Florida water management districts (Districts) meet in the area. Identifying the sustainable quantities of traditional groundwater sources available for water supplies that can be used without causing unacceptable harm to the water resources and associated natural systems. Developing strategies to meet water demands that are in excess of the sustainable yield of existing traditional groundwater sources. Establishing consistent rules and regulations for the three water management districts that meet their collective goals, and implement the results of the Central Florida Water Initiative. Review and update the 2015 CFWI Regional Water Supply Plan (RWSP), as well as the sustainable quantities of traditional groundwater sources available in the CFWI area that can be used without causing unacceptable harm to the water resources and associated natural systems. Monitor progress of regional strategies and solutions identified in the 2015 CFWI Plan; review and update strategies to meet water demands that are in excess of the sustainable yield of existing traditional groundwater sources. Establish consistent rules and regulations for the three water management districts that meet the Collaborative Process Goals and implement the results of this Central Florida Water Initiative. Encourage funding for regional strategies necessary to achieve the objectives of the CFWI. An example of development in the CFWI. Fresh traditional groundwater resources alone cannot meet future water demands or current permitted allocations without resulting in unacceptable impacts to water resources and related natural systems. Average total water use is about 800 million gallons per day (mgd). The planning area will need approximately 300 mgd of additional water supplies by the year 2035. 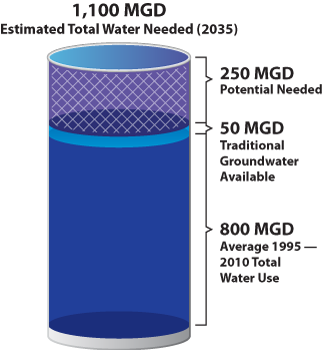 Approximately 50 mgd of additional groundwater could be available for water supply on a regional basis, though the implementation of management activities (e.g., wellfield optimization, aquifer recharge and augmentation) will be required to avoid or mitigate impacts to the region’s water resources. The remaining 250 mgd will have to be met through increased water conservation and alternative sources.